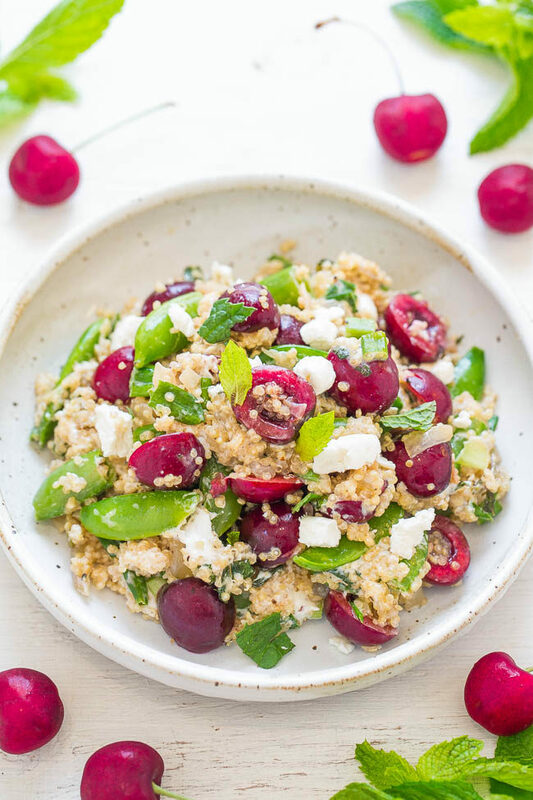 Quinoa, Cherry, and Goat Cheese Salad – Healthy, EASY, and loaded with juicy cherries, tangy goat cheese, snap peas, mint, and more!! The PERFECT light yet satisfying salad with so many great flavors!! I absolutely love fresh cherries and because they have such a short season I find myself wanting to eat them any way I can. 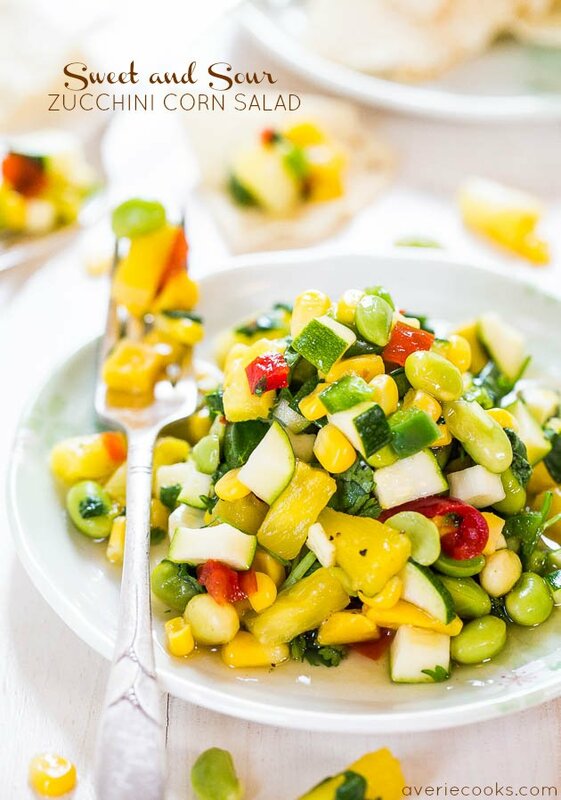 Including savoring them a light, refreshing salad that’s easy, healthy, ready in 30 minutes, and packed with texture and flavors galore. Tender yet chewy quinoa is mixed with lightly caramelized sweet yellow onions and fresh green onions to boost the savory flavor while the juicy cherries and crisp sugar snap peas add sweeter notes. I love salty-and-sweet desserts so why not do the same with my salads. 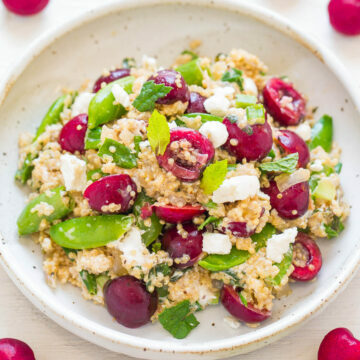 Apple cider vinegar and lemon juice really brighten up the dish up and perfectly complement the various veggies and cherries while goat cheese adds a tangy loveliness. I used a honey chèvre that was perfect but your favorite goat (or feta, gorgonzola, or sharp cheddar) will all work. If you want the goat cheese to stay more intact rather than melting into the quinoa (delicious but not as visually striking), wait for the quinoa to cool before adding the cheese. I finished the salad with mint and it adds the perfect summery fresh touch. Or if basil is exploding in your garden, it also works well. If you want to make the salad but cannot find fresh cherries, go ahead and use red grapes or possible even frozen cherries instead. The salad is great right away but it’s a perfect make-ahead recipe because it can be served either warm or cold. It’s a great salad for lunch boxes, picnics, potlucks, and parties. It’s accidentally gluten-free and vegetarian or vegan (omit the cheese). A light, refreshing, gluten-free, vegetarian salad that’s easy, healthy, ready in 30 minutes, and packed with texture and flavors galore. 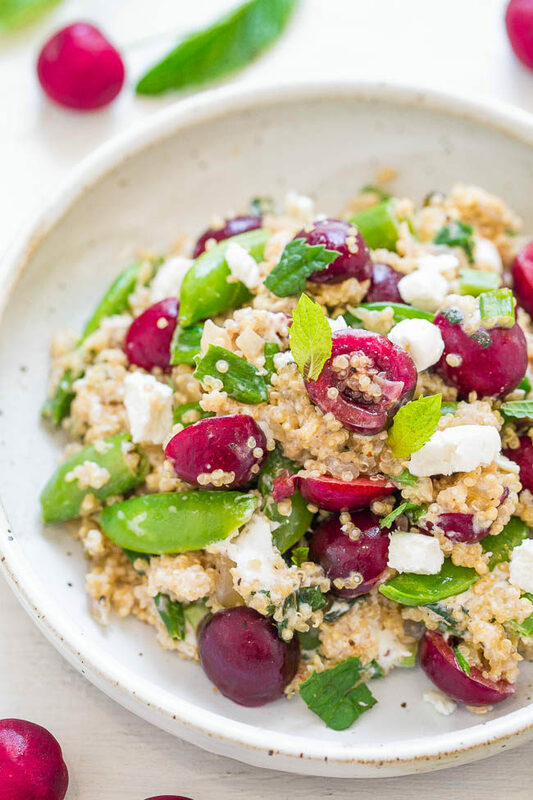 Quinoa is mixed with lightly caramelized sweet yellow onions and fresh green onions to boost the savory flavor while the juicy cherries and crisp sugar snap peas add sweeter notes. Apple cider vinegar and lemon juice really brighten up the dish up while goat cheese adds a tangy loveliness. To a large skillet or saucepan, add the olive oil, sweet Vidalia onions, and cook over medium-high heat, stirring occasionally, until onions have softened and just begin to lightly caramelize, about 7 minutes. Add the water, apple cider vinegar, lemon juice, 1 teaspoon salt, 1/2 teaspoon pepper, stir to combine, reduce the heat to low, cover pan, and cook for about 12 to 15 minutes, or until all liquid has been absorbed. While quinoa cooks, chop the remaining ingredients. To a very large bowl, add the green onions, cherries, snap peas, cheese, season with salt and pepper to taste (I used about 1/2 teaspoon of each), and stir to combine. Add the quinoa (allow quinoa to cool first if you want the cheese to stay intact and not melt as much) and stir to combine. Taste and check for seasoning balance, adding salt, pepper, and optional apple cider vinegar, lemon juice, and honey to taste (I found the dish needed the final three ‘optional’ ingredients for depth of flavor but preferences vary). Dish can be served warm and immediately or stored in an airtight container in the fridge for up to 5 days. 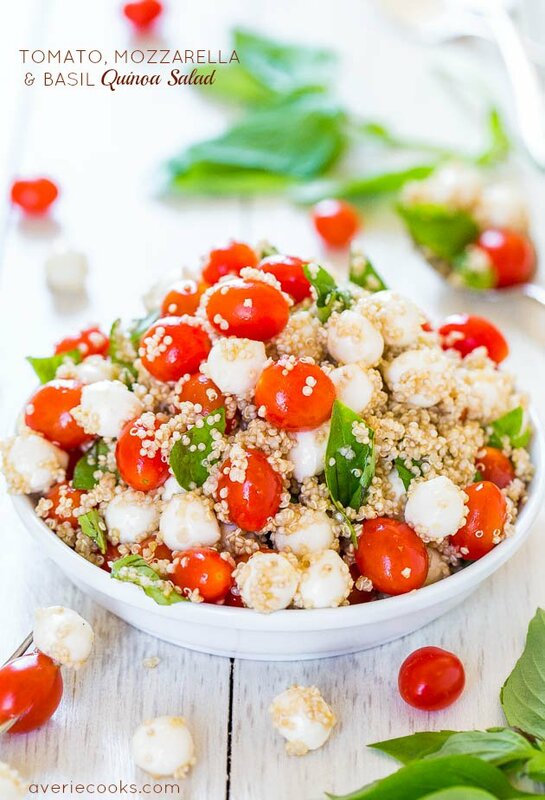 Garden Fresh Quinoa Salad – Loaded with everything fresh, light, healthy, and summery! Great for parties, potlucks, and lunch boxes because there’s no mayo! Make this easy and flavorful dish before summer disappears! 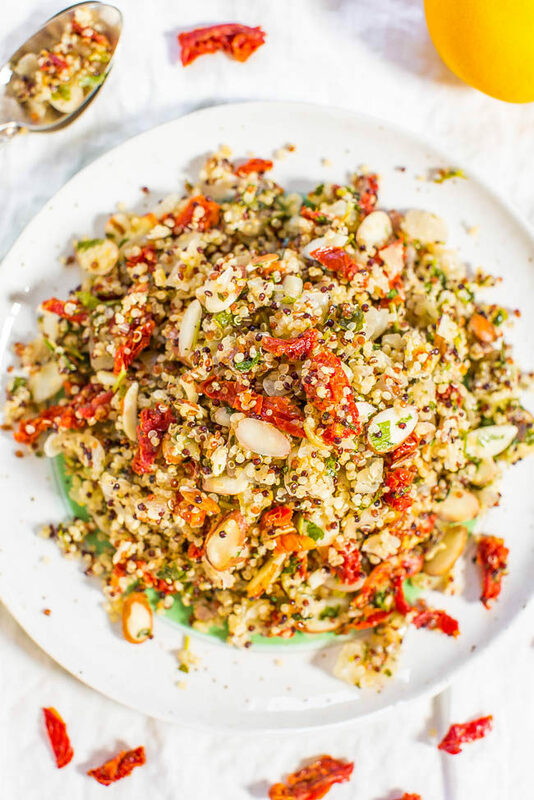 Lemon, Sun-Dried Tomato, and Almond Quinoa Salad – Fast, easy, and fresh! Bright flavors and loads of texture! This clean-eating salad keeps you full and satisfied! Healthy never tasted so good! No mayo and great for outdoor events or lunch boxes! 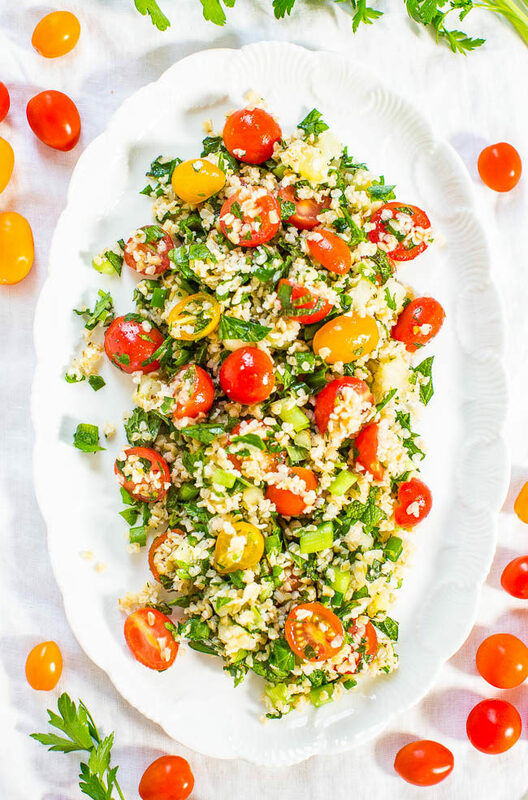 Tabbouleh – Never had it? 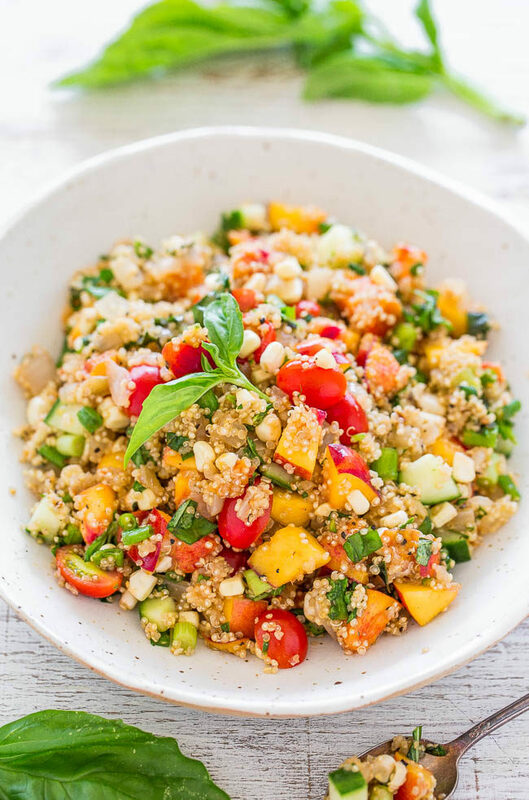 Think couscous or quinoa mixed with vegetables, herbs, lemon and olive oil! Easy, no cooking required, healthy, and packed with so much flavor! Great for outdoor events because there’s no mayo! I like the idea of snap peas and cherries in a salad. It isn’t a combination I’ve ever come across or tried and I am guessing the lemon and mint really pulls it all together. My mint is exploding out of its pot so I need lots of ideas for it. I gotta try this one! If you have homegrown mint, make this! I know you’re going to love it. There’s something about all the flavors together, the sweet cherries, the lemon, with the mint, and the crunchy snap peas and the tangy goat cheese. We loved this one. Love this combination Averie! All the flavors work so well together and it is a fresh, unique recipe for me. It’s also a great use for my mint which I need right now! I’m so glad you loved it! And yes, it’s a fresh and unique recipe that we really enjoyed too! I wish I had mint plants like you do! I’ve been loving it with summer tomatoes as a nice switchup from basil. Followed this recipe and added the optional ingredients. So dang good. I have made this 3 weeks in a row. Fun to use cherries as I hardly ever eat them. Enough for 5 Tupperware lunch containers. Plan for more time than you think to halve the cherries. Took me like 30 minutes just doing that. This Is a bomb salad. Break away from lettuce and give this salad a try. Oh and dont overthink the measurements. I didt weigh or cup out the cherries or other veggies. I just used a full bag of cherries, full bag of snap peas, full bundle of green onion…etc.. it was fine.